The essays which compose this volume deal chiefly with a variety of subjects to which every physician must have given more or less thought. 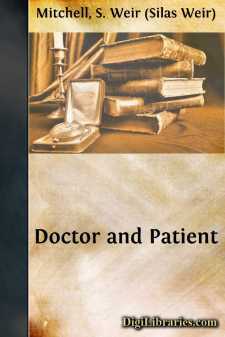 Some of them touch on matters concerning the mutual relation of physician and patient, but are meant to interest and instruct the laity rather than the medical attendant. The larger number have from their nature a closer relation to the needs of women than of men. It has been my fate of late years to have in my medical care very many women who, from one or another cause, were what is called nervous. Few of them were so happily constituted as to need from me neither counsel nor warnings. Very often such were desired, more commonly they were given unsought, as but a part of that duty which the physician feels, a duty which is but half fulfilled when we think of the body as our only province. Many times I have been asked if there were no book that helpfully dealt with some of the questions which a weak or nervous woman, or a woman who has been these, would wish to have answered. I knew of none, nor can I flatter myself that the parts of this present little volume, in which I have sought to aid this class of patients, are fully adequate to the purpose. I was tempted when I wrote these essays to call them lay sermons, so serious did some of their subjects seem to me. They touch, indeed, on matters involving certain of the most difficult problems in human life, and involve so much that goes to mar or make character, that no man could too gravely approach such a task. Not all, however, of these chapters are of this nature, and I have, therefore, contented myself with a title which does not so clearly suggest the preacher. It would be scarcely correct to state that their substance or advice was personally addressed to those still actually nervous. To them a word or two of sustaining approval, a smiling remonstrance, or a few phrases of definite explanation, are all that the wise and patient doctor should then wish to use. Constant inquiries and a too great appearance of what must be at times merely acted interest, are harmful.